Big Announcement – New Blog! Although I’ve stopped blogging over here, that doesn’t mean my life as a blogger is over. With my baby getting bigger and bigger, I wanted to start writing in public again. I realized that I wanted to write about parenthood, but not be stuck in the “mommy blogger” niche. So I launched “We’ll Eat You Up, We Love You So,” with a title stolen from Where the Wild Things Are, one of my favorite stories as both a child and adult. As the literary title suggests, I’ll be writing about children’s books and other pop culture when I run short on adorable (or horrifying) baby stories. I hope you check out my new home! While I have stopped writing on here – at least for now – I did wrap up my bike blogging career with a post on Simply Bike. Written by “S,” who I actually used to follow on the excellent fashion blog Academichic, Simply Bike has a series on Biking While Pregnant. As reading these posts helped me gain back a lot of my confidence in my ability to bike while pregnant, I wanted to contribute! Check out my post: Cycling While Pregnant – Shannon from Washington D.C.
My husband and I are celebrating our baby’s one week birthday this week! I gave birth last Sunday at 3:15 PM to a beautiful, healthy baby. He’s just as wonderful one week later as the day he arrived. Writing this blog for more than two years has been a labor of love, with both parts of that phrase holding equal weight. There have been weeks when it was nothing but labor – wondering what topic I could possibly write about, then struggling to find the words to form a post. At other times, it’s been terribly rewarding – when people say they appreciate my posts, say they’ve been inspired by me, or when I just enjoy sharing an experience I’ve had. But now, I’m going to be putting this blog to bed. My upcoming shift in lifestyle is the main impetus behind this decision. In the past few months, I haven’t been updating this blog nearly as often as I once was. I’ve only been posting once a week at best and missed a number of weeks altogether. With my due date tomorrow, I’ve had a lot of other priorities. Unfortunately, after our lovely son arrives, I’m going to be even more pressed for time. In addition, my basic activities will be changing. I’ll still be gardening throughout the summer, but my chances to sit down and write about what I’ve learned will be few. My biking will be taking even more of a hit. Due to a combination of weather, needed bike repair, busyness, and the awkwardness of being late into my third trimester, I haven’t been outside on my bike since the Tour de Cookie a month and a half ago. I didn’t mean for it to be the last outdoor bike ride of my pregnancy, but it just turned out that way. Once I give birth, I can’t get back on the bike for at least six weeks and even then, my cycling will be limited. I can’t carry my son via a trailer or bike seat until next spring, so I’ll probably just be doing short spins around the neighborhood. Lastly, my volunteer time is going to be crunched. I’m not planning any rides this year like I have in the past; I’ll be happy if I can fit in one meeting a month. But beyond the baby, I’m also running out of posts to write. It’s not like I’m completely out of things to say about these topics, but I’d like to develop some into more substantial essays for a magazine article or book. With others, I don’t want to be repetitive – there’s only so much I can say about biking the Millenium Trail or starting seeds. While I wish I could write about every ride in a hilariously stream-of-consciousness manner like Tales from the Sharrows (who himself isn’t actually doing that anymore), I’m just not that naturally trippy. None of this is to say that I won’t miss the blog. I started it with three motives – to raise money for the Climate Ride, to be an advocate for the issues I’m passionate about, and to bring discipline to my writing. While I think I miserably failed at the first – I don’t think I earned an extra dime as a result – I hope I’ve been at least moderately successful at the other two. By framing my favorite hobbies as things that anyone can do, I hope my writing has inspired people to try gardening or biking. Honestly, I don’t know exactly what effect I’ve had on my audience, but I hope it’s been positive. The biggest effect I’ve seen is on my own writing. This blog is probably the most ambitious writing project I’ve even taken on, including my graduate thesis. Now, while my graduate thesis required months of research and a hair-tearing amount of editing, it ended up being just under 60 pages. In contrast, this blog has more than 200 posts totaling hundreds of pages. Also, unlike a single project with a deadline, it required constant commitment. Most importantly, it demanded this care and feeding while I have a writing-heavy full-time job that I love. All of this required me to develop a level of discipline in regards to writing thoughtfully that I’m very grateful for. With all of that in mind, I say goodbye to this blog and to my readers. I certainly won’t stop writing – I hope to do some freelancing for local and specialty magazines/blogs – but it will be fundamentally different. My regular readership is very small, but I still appreciate every single one of you and your comments, even when it took me weeks to respond. I hope that you’ve enjoyed reading and that your future involves a good deal of enjoyable bicycling and sustainable, delicious food. Onions and garlic are the basis for nearly all of my cooking, whether it’s Asian, Italian, or generic “American.” From pasta sauces to curry, they are endlessly useful. Despite that, they’re surprisingly hard to find at the farmers’ market. I suspect that people aren’t willing to pay enough to support the farmers because these particular vegetables are so cheap at the grocery store. Because of my love for and versatility of these ingredients, I’ve tried to grow them for the past few years. Even though other people told me it was simple, until now, I’ve had limited success. Garlic and onions are some of the few vegetables that overwinter well, surviving even hearty frosts. 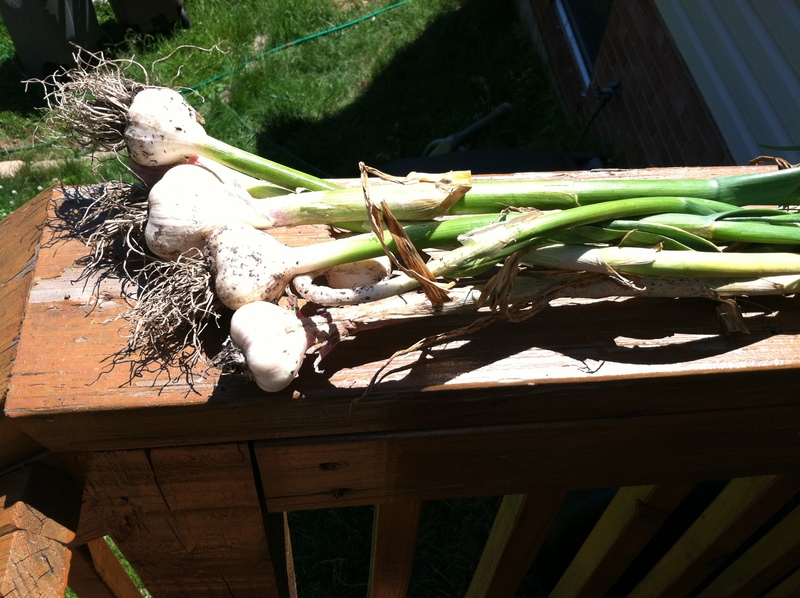 If you plant garlic in the springtime – as I did the first time I tried to grow it – it actually grows much less than if you plant it in the fall. In areas like mine that have sporadic hard frosts in the winter, the garlic will sprout during warmer times and carry through the colder ones. In areas that have consistent frosts, the plants will go dormant in the fall and then sprout in the spring, growing quickly in the cool weather. In contrast, planting them in the spring doesn’t give them enough time to grow before the hot weather hits, which abruptly slows down their output. In fact, spring-planted garlic may never form bulbs in warmer locations because the plants need to be exposed to one to two months of temperatures between 32 and 50 degrees to even start forming bulbs. I found out the truth of this when I dug up my spring-planted garlic last year. Even though it seemed ready to harvest after a whole summer of growing, it barely produced more than the single bulb I had planted. So this past fall, after I laid down my layers of leaves, newspapers, and LeafGro, I planted garlic. Ideally, I would have used a local variety from the farmers market, but I ended up grabbing grocery store ones from the counter and sticking them in the ground. While I don’t have personal experience with it, planting onions in the fall seems to have similar advantages. In theory, you should harvest both garlic and onions in late June or early July. But this being Washington D.C., the Nation’s Capital built on a sticky mess of a marsh, we had 90 degree temperatures in April. And then again in May. While neither stuck around for long, it was enough to definitely affect my plants. My onions bolted, shooting up flowering stalks. When vegetable plants bolt, they start putting their energy and resources (like water and nutrients) into reproducing rather than agriculturally productive activities like growing me vegetables. Unlike other plants such as basil, which you can stop bolting if you break off the flowers, bolted onions are a lost cause. You have to dig them up and use them right away. You can usually store onions in a root cellar or another cool, dry place for months. In contrast, bolted onions not only stop producing once they bolt, but start breaking down, compromising the ability to store them. Unfortunately, I only had two onions that actually came up, so it didn’t matter all that much. On the other hand, even they were a pleasant surprise, as I have no idea when I planted them. I dug them up over the weekend and already used one to make nut burgers and hope to use the other one soon. Most of my garlic didn’t bolt, but it was definitely starting to die back. The leaves on several of the plants were yellowed and dry, a guarantee the bulbs aren’t going to grow any more. Even though not all of them were as far gone as possible, I dug up all of it so I could make space for my newly arrived sweet potato starts. For the most part, I was pleased with my garlic harvest. They came up easily, so I didn’t damage any of the surrounding plants digging them up. Because I pulled it so early, most of the bulbs were rather small, but about the same size as normal supermarket garlic. While some of them had some funky white mold on them, I easily removed it by brushing off the soil and peeling off the outermost layer of skin. Unlike the onions, I’m hoping to store at least some of my garlic. I do love using it, but five full bulbs could take quite a while! To prepare it for storage, I’m drying it. From my research, it seems like the best way to dry garlic is to gather it together and hang it somewhere relatively dark, as sunlight can change the flavor. Currently, I’m hanging it in my basement, where it’s dark and relatively cool. I didn’t want to run the risk of hanging it outside and it being exposed to both the elements and wildlife. The chances of it rotting or getting nibbled on were too high to risk. While I’m pleased with my crop, I feel like it could have been much more extensive. Although I don’t want garlic to take up half of my garden, I harvested it so early that I feel like I could have planted much more and still had enough space. In the future, I’ll probably plant it much closer together. Either way, I know I’ll be enjoying some wonderfully garlicky tomato sauce straight from the garden when my tomatoes and basil start producing.